Pinnacle’s standard double wall tank comes with a 440 BBL capacity. Standard features include front and rear 4” drains, dual 36” manways on the roof, and three 4” flange connections on the roof. Custom options are available upon request. 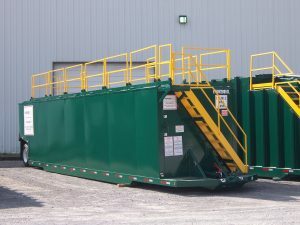 We also offer a 190 BBL roll-off version of the double wall tank. Contact Pinnacle to learn more!